The fast pace of business acquisitions is driven by buyers who are able to see more value within a business than conventional analysts and professional valuation experts can see using old fashioned rules and calculation standards. There is usually Additional Value to be obtained from a business than can be calculated using conventional calculations. Business Value Calculation for Excel shows how to prepare a conventional valuation using ready made templates and calculates the Additional (hidden) Values. To obtain Additional Value figures in Business Value Calculation for Excel, a conventional twelve month profit and loss forecast is prepared using the P-L Template. Business Value Calculation for Excel automatically generates a 10 year forecast from this current year scenario applying growth rate extrapolation percentages supplied by the user. The extrapolation spreadsheet can be used to prepare the base earnings scenario for a 10 year business plan valuation. Unwanted rows can be hidden. Valuation calculations use a selected choice of multiples of Revenue, EBITDA or discounted cash flow (present value) applied to the target required rate of return on acquisition capital. In addition to the Additional Value calculations, a business valuation can be adjusted using balance sheet figures. The basis of valuation to apply can be selected and the table automatically adjusts the Total Value. 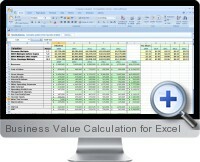 Business Value Calculation for Excel can incorporate Industry Benchmarks into the Value calculations. Industry and the benchmark ratios can be selected and included into the valuation calculations if you wish. The resulting valuation can be very quick and accurate and relevant to the current time frame using data from the US acquisitions and mergers market updated monthly. The Business Value Calculation currency can be set to any symbol by opening the Format menu in Excel and selecting Cells from the drop down list.